What is a freestanding ER? When you or a member of your family has a medical emergency like chest or abdominal pain, signs of a stroke or difficulty breathing, it’s critical to get help fast. Stand-alone ERs can be more convenient and closer to home for true emergencies. Learn how to tell whether you should visit a freestanding ER, an urgent care, your primary care doctor or a hospital. Photo: Getty Images. That’s when a freestanding ER can be ideal because these facilities are often closer to home than a large hospital. And at stand-alone facilities, you’ll find the same highly qualified emergency medicine doctors and specially trained emergency nurses who have worked in trauma centers. “You will get the finest care,” said Dr. Mike Mitchell, medical director for the emergency department at UCHealth Broomfield Hospital and regional medical director for freestanding ERs in the Denver area. Mitchell emphasized that freestanding ERs are not urgent care facilities. They’re only for true emergencies, not for an urgent issue like a cut, sprain, possible broken bone, migraine, sore throat or the flu. “If you have a cough or a cold, that can be handled by your primary care provider, in urgent care or through a virtual care visit,” Mitchell said. Primary care clinics, urgent care centers and virtual visits are less expensive than both freestanding and hospital-based emergency rooms. But, if someone is unconscious or appears to be having trouble speaking, moving a limb or breathing, emergency care is critical. Freestanding ERs provide fast help close to home. They’re usually small, with an average of about eight beds. Because freestanding ERs typically are smaller and much less busy than hospital ERs, wait times often are shorter than at larger facilities. And doctors do personal follow-up calls with each patient. “When I worked in a hospital, I could spend about five minutes with a patient. Now, I can sit down and spend 10 to 15 minutes with each person. Our wait time from the time you walk in the door until a physician sees you is about three minutes,” Mitchell said. In a true emergency, Mitchell said the biggest mistake family and friends make can be waiting too long to seek help. If you are uncertain, act fast. To help patients and family members better understand where they should receive care, here are some guidelines. 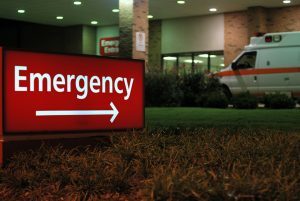 What is a freestanding ER and when should you seek help there? Always call 911 immediately if someone is unconscious, having trouble breathing, has a serious injury or may be having a stroke or heart attack. A freestanding ER is just like an emergency department in a large hospital. What’s different is that it’s a stand-alone facility. Why go to a freestanding ER? Wait times are usually shorter and freestanding ERs often are closer to patients’ homes. You’ll get convenient help close to home. Doctors at freestanding ERs do follow-up calls with patients the day after their release. At freestanding ERs, additional customer service is standard. As part of the care – which costs the same as a hospital ER visit – patients receive a follow-up call from a doctor the next day. Freestanding ERs have specially trained doctors who are board-certified in emergency medicine. Nurses at these facilities also have special training in emergency care. A freestanding ER is not physically connected to a hospital, but doctors there can perform many of the available tests and procedures that you would find in a hospital-based ER. Unlike most urgent care centers, a freestanding ER can do lab tests, conduct ultrasounds and CT scans. Freestanding ERs are not urgent care facilities. Seek help at an ER only if you have a true emergency. How do you tell the difference between a medical emergency and an urgent issue? You need emergency care if you or a loved one has suffered a serious injury, is struggling to breathe, is dealing with an overdose, suicidal thoughts, chest pain or severe abdominal pain. 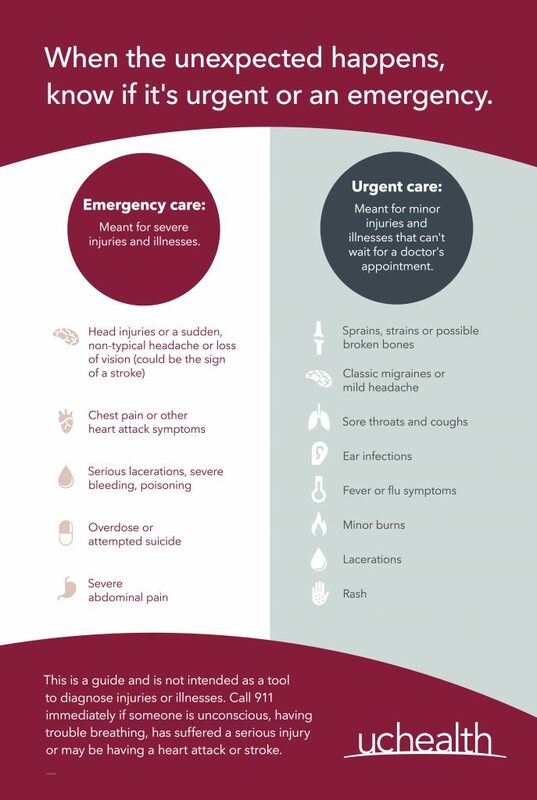 Urgent care is for minor injuries that need medical attention, but are not life-threatening. These include sprains, possible broken limbs, migraines, animal bites, coughs, colds, flu symptoms, sore throats, ear infections and minor burns. And possible strokes always require immediate attention. With strokes, remember to Act FAST and hone in on signs of stroke. “F” stands for facial drooping. “A” is for arms. Ask the patient to lift both arms. Does one arm drift downward? “S” stands for speech. If the person is slurring words or having trouble speaking, call 911. And “T” is for time. With strokes, the faster a patient gets care, the greater the benefit to the brain. Time equals brain. So call for help fast.